MOUNTAINVILLE, NY — Have you ever wanted to walk through a large shirt? 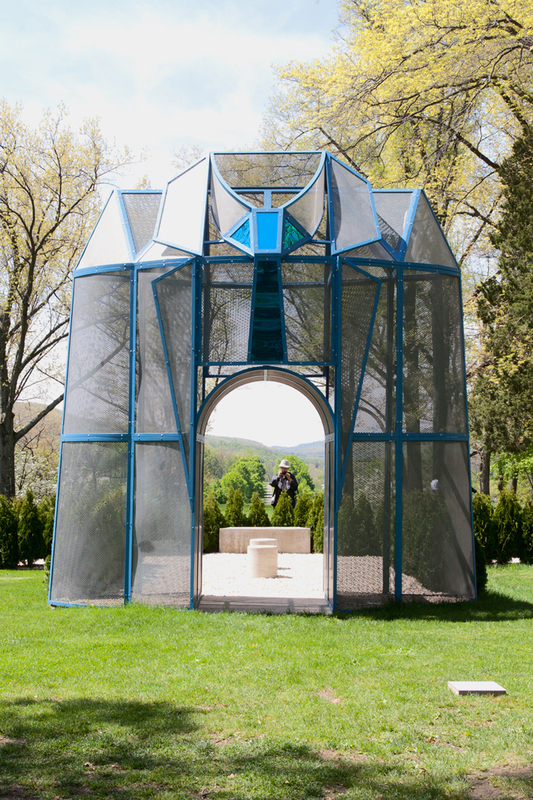 Whether or not you’ve entertained the notion, it is now a real possibility at Storm King Art Center. 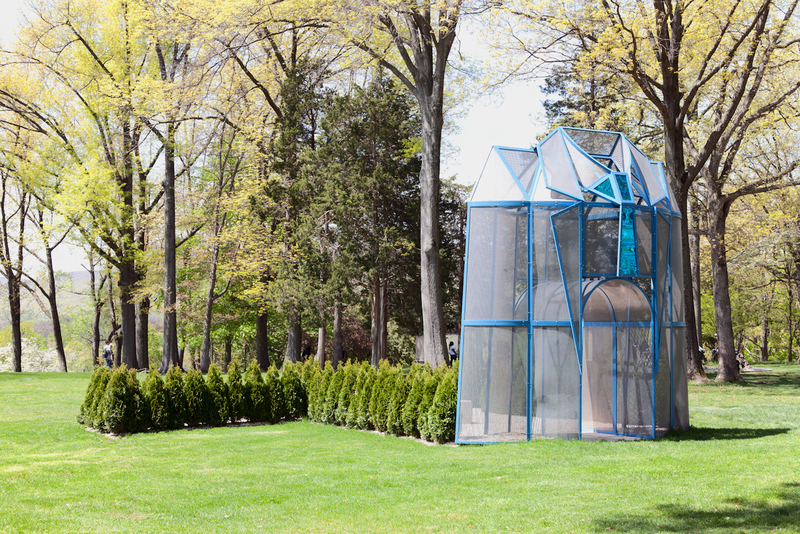 The upstate New York sculpture park is currently home to a super-sized sculpture of a collared men’s shirt and tie, conceived by Dennis Oppenheim. 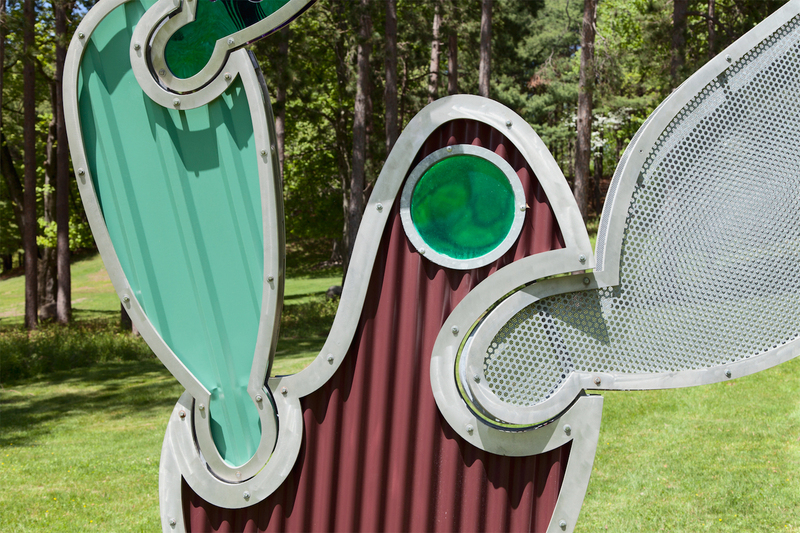 The work serves as an archway to a garden with benches shaped like buttons and cuffs. 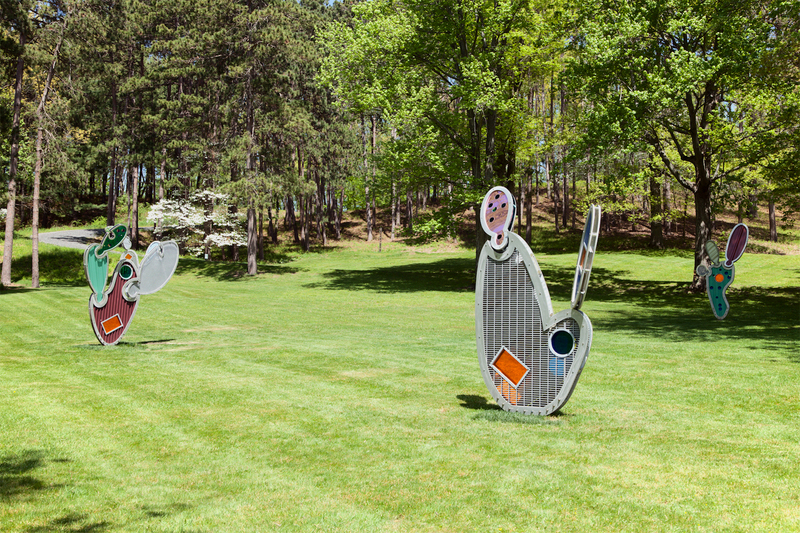 Rising 16 feet on the museum’s main hill, the gleaming, painted steel work is part of Dennis Oppenheim: Terrestrial Studio, an exhibition that highlights the diverse ways the late, constantly creating artist engaged with the outdoors throughout his life. The playful blue dress shirt, solemnly titled “Entrance to a Garden,” is one of two of Oppenheim’s major earthworks previously never realized. Just as that sartorial sculpture creates an intimate, outdoor, public gathering space, the second, too, draws people together in an unexpected space. 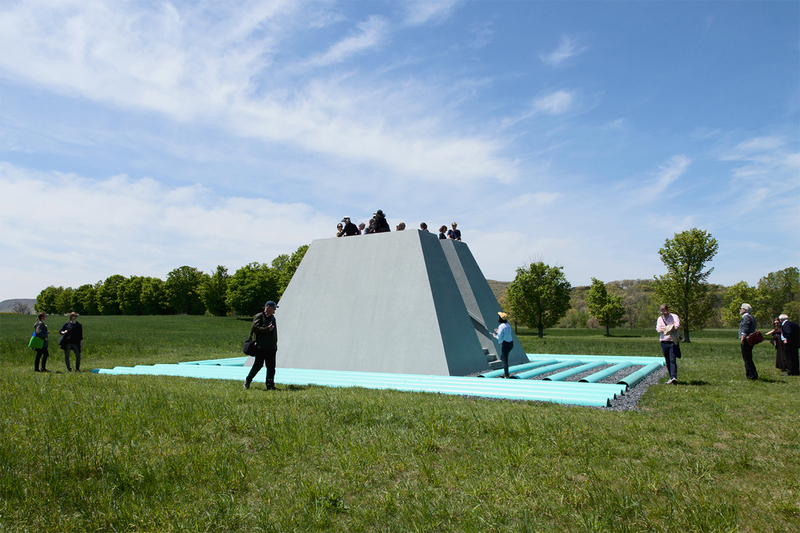 Popping out against the verdant greenery of Storm King’s South Fields is “Dead Furrow” (1967/2016), a hulking trapezoidal structure with an inset staircase that leads to an open-air viewing platform. 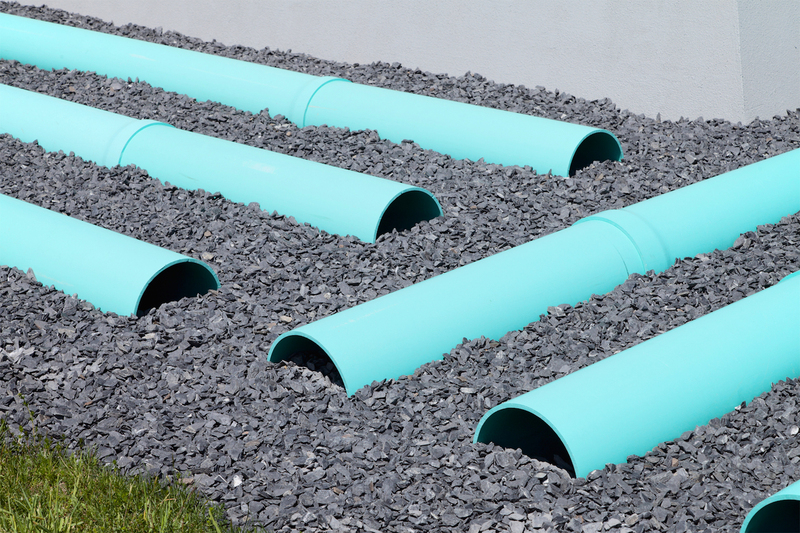 Bordered by celeste-colored PVC pipes set in orderly rows, it suggests a moat-bordered ziggurat that radiates beneath the expansive, azure sky. 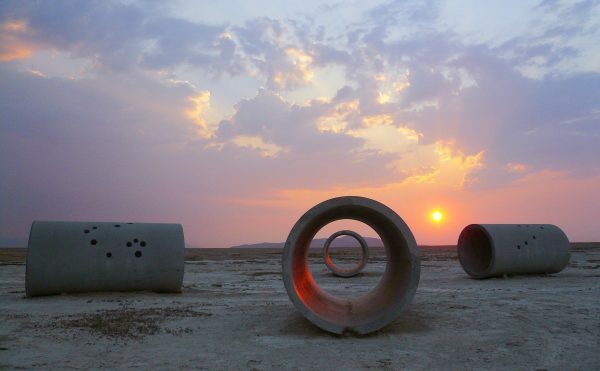 And the view it offers at the top is just as stunning: Oppenheim intended that “Dead Furrow” offer its visitors a 360˚ panorama of their surroundings for at least a one-mile distance. 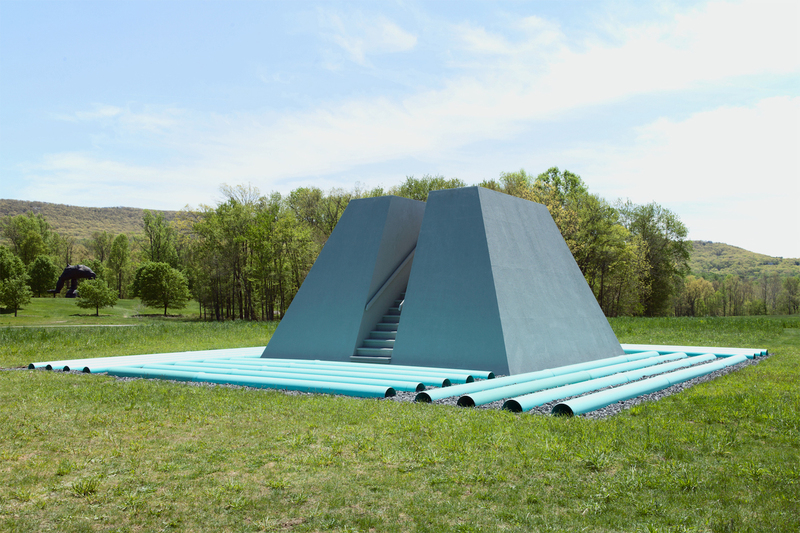 At Storm King, where the permanent Calders, di Suveros, and Hepworths enhance the natural space beautifully but stand solely for observation, Oppenheim’s industrial viewing station offers a rare chance to become part of the sculpture, and from within, look out to take in the rolling hills, trees, and distant mountains. 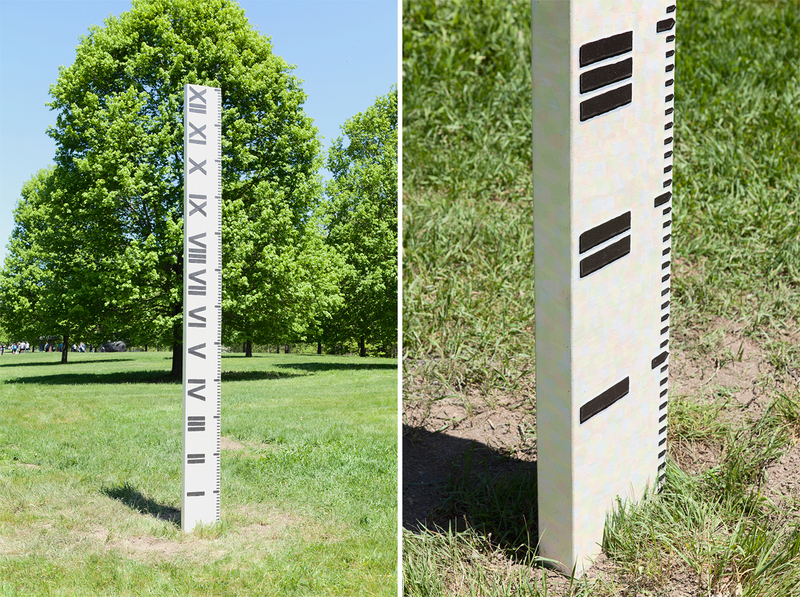 “Dead Furrow” is an agricultural term that refers to a type of trench created by plows, and many of Oppenheim’s outdoor works consider different ways of marking the landscape to perceive its scale rather that simply enriching it. 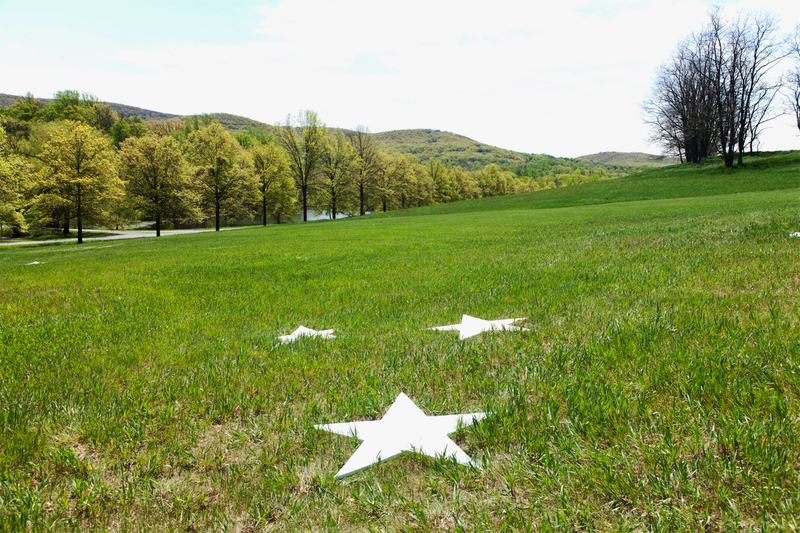 Scattered across another open field are painted wooden stars, each about four-feet wide, their colors faint from full exposure to the sun’s glare. Originally made in 1977, while Oppenheim was a visiting artist at the University of Montana, “Wishing the Mountains Madness” (1977/2016) uses the signs of the heavens to brand the earth, creating a strange feeling of cosmic inversion — of madness, you could say. 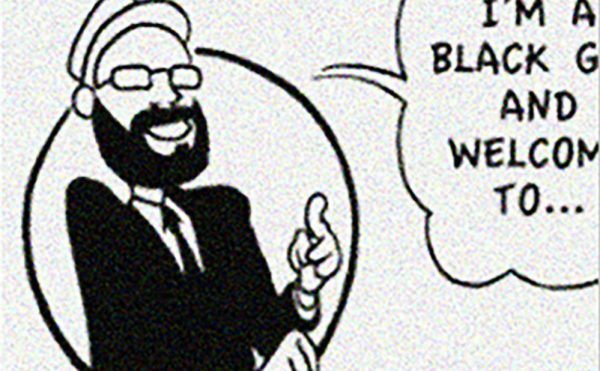 Usually distant dots in the sky, the stars here are large and stereotyped but spread, flat, across two acres; so while you may see only a few at time, there are really 50 around you. 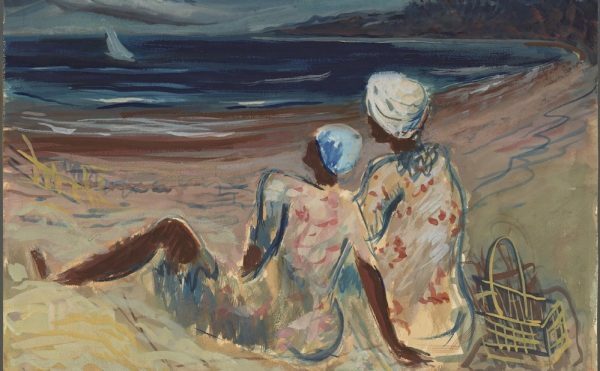 You feel smaller than usual, standing on the same plane as these depictions of celestial bodies — more aware of being one speck in this universe. Visitors can see a full view of this starry installation in the museum building, where aerial photographs of it from the Montana display are on view. 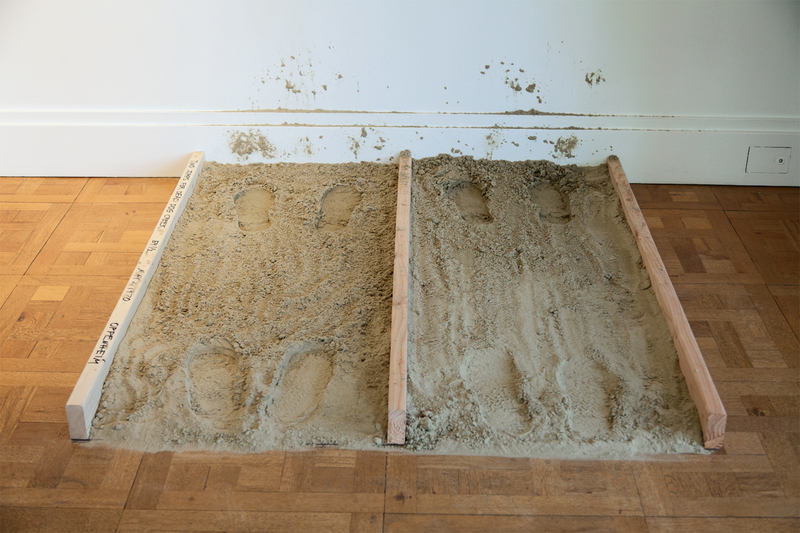 Other products of Oppenheim’s studio fill various floors, including more sculpture, drawings, video works, and photography that show his unusual approaches to engaging with the land all over the United States and even around the world. Photographs of “Boundary Split” (1968) show the cuts in ice Oppenheim made in Maine at the US–Canada border with a gasoline-powered chain saw; other images from that same year document “Landslide,” for which he inserted right-angled, wooden boards into a heap of dirt by the Long Island Expressway to create a 1,000-foot-long stream of orderly marks. 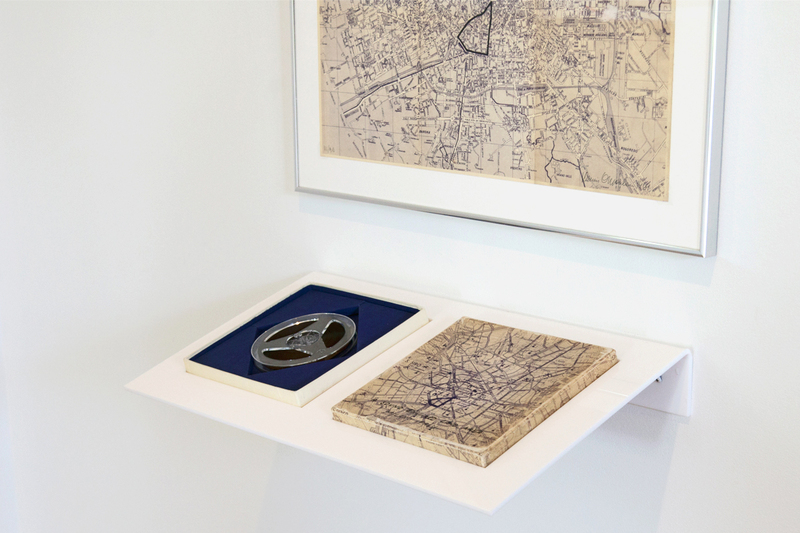 In 1969, Oppenheim recorded the sound of his footsteps as he walked through Milan while following a map; the reel-to-reel recording of his steady paces, along with the map, are also on display. 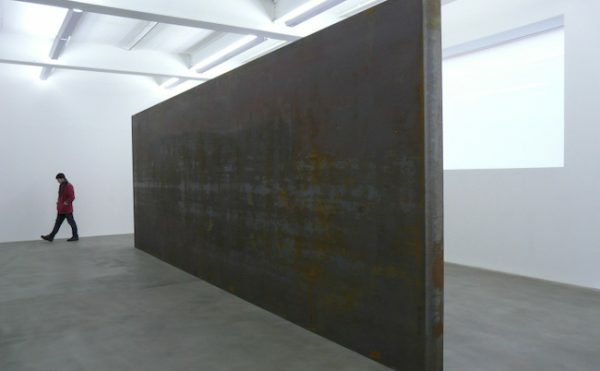 These are just a number of his confined projects that make clear his unceasing interest in making sense of the world’s vastness and his own place within it. 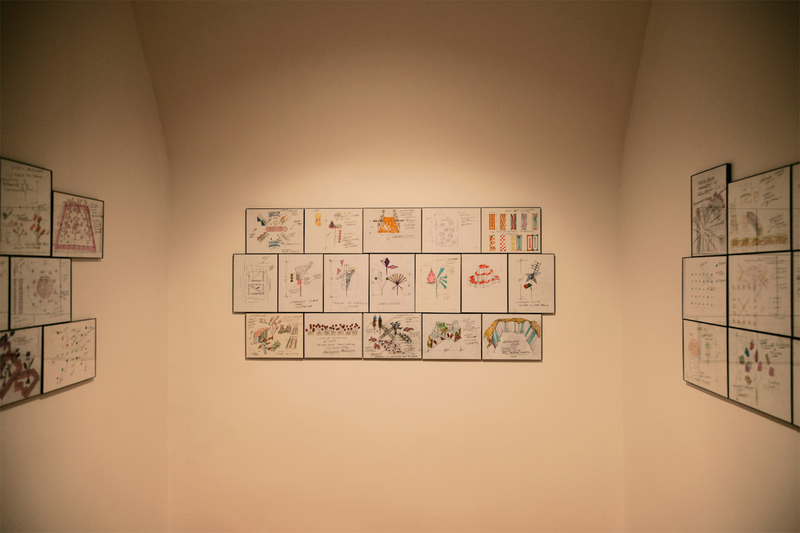 Many of Oppenheim’s illustrations for projects also here, including preliminary drawings of his “Architectural Cactus Grove,” an installation of six metal works that stand outside in the North Woods. Fusing together globular, colorful shapes, each sculpture punctures the field, with their protuberances all balancing carefully on a slim base. They are animated, appearing to spring from the earth and shining with the luminescence so prominent in Oppenheim’s other outdoor sculptures. Each is unique, but all stress Oppenheim’s exploratory approach to his wide-ranging work, marrying materials of various colors and textures: translucent fiberglass panels, aluminum sheets, roofing panels, and metal grating come together to form a whimsical desert of metal set in a lush oasis of green. 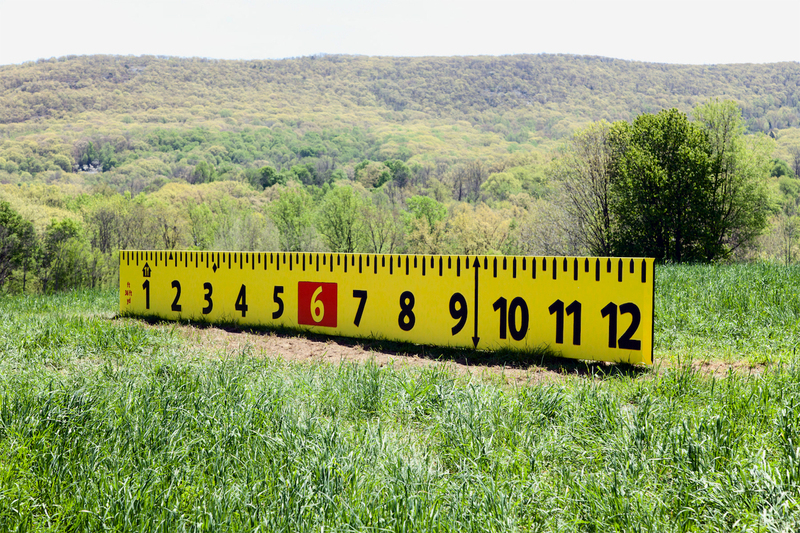 The largest, at 36-feet-long, is a replica of a yellow yardstick, stretching long across the South Fields with distant green hills as its backdrop. The other two stand vertically. 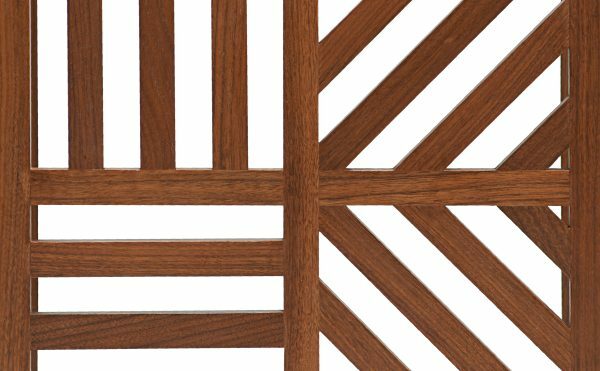 One rises in the center of a ring formed by over 20 maple trees, and it is painted with shiny, subtle rainbow-colored patches and Roman, rather than Arabic, numerals. 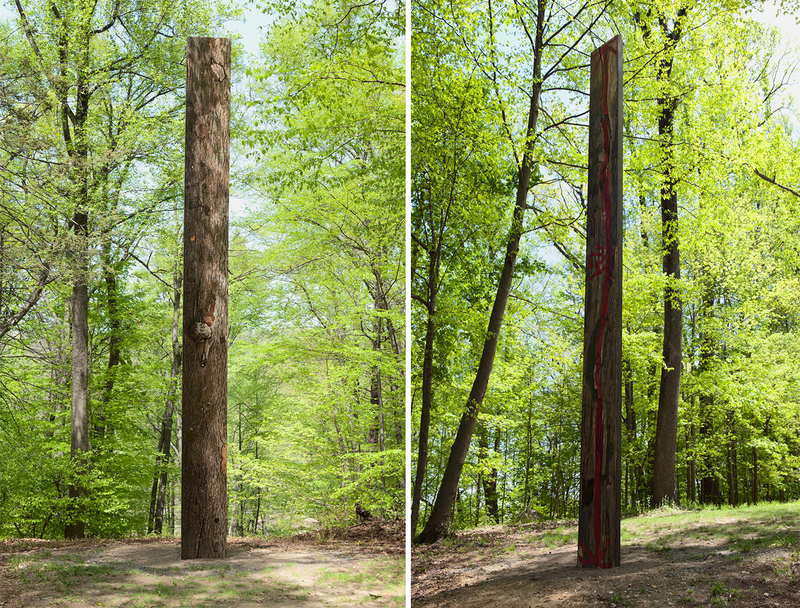 Halvorson intended to restructure the space as a sundial, inviting contemplation of not just the height of the trees but also time, as the sun sets and shadows shift slowly. Venture into the North Woods, and you could almost overlook the third work, which Halvorson painted to resemble a tree trunk on one side. It features an arrow in blood red on the other side and the number 24 that relays its total height in feet. 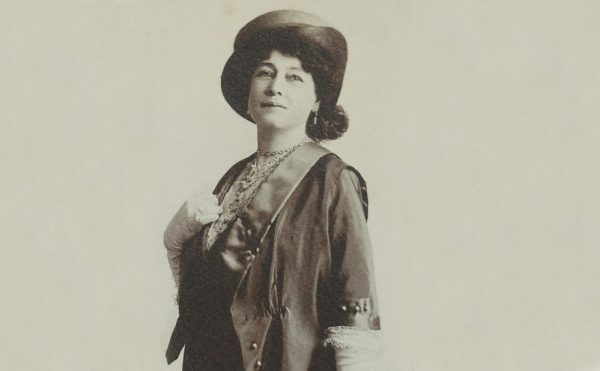 Her variances on traditional measurement tools influence our understanding of the landscape and our own relationship to it in a more definitive and concrete way. 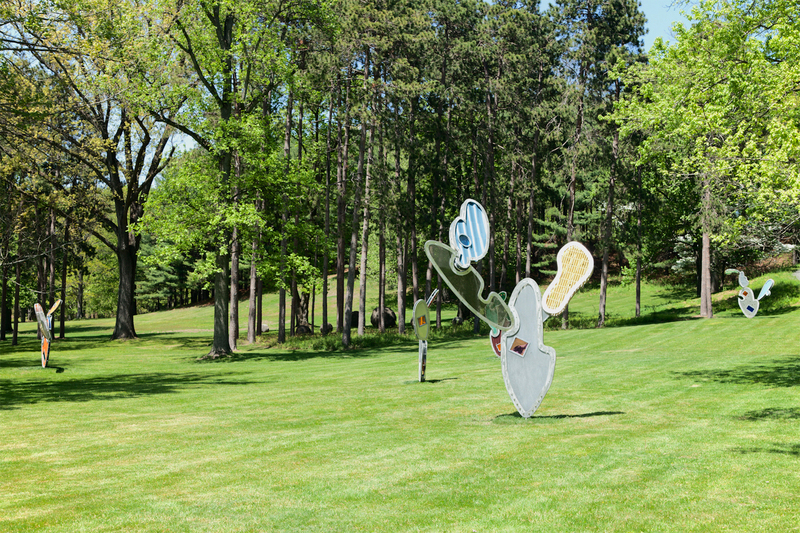 They highlight how perspective may bewilder or mislead; at the 500-acre Storm King, where you have no sense of how large an isolated work like Oppenheim’s “Dead Furrow” is from a distance, such sculptures are smart and cheeky additions to the sweeping grounds. Dennis Oppenheim: Terrestrial Studio continues through November 13 and Outlooks: Josephine Halvorson through November 27. 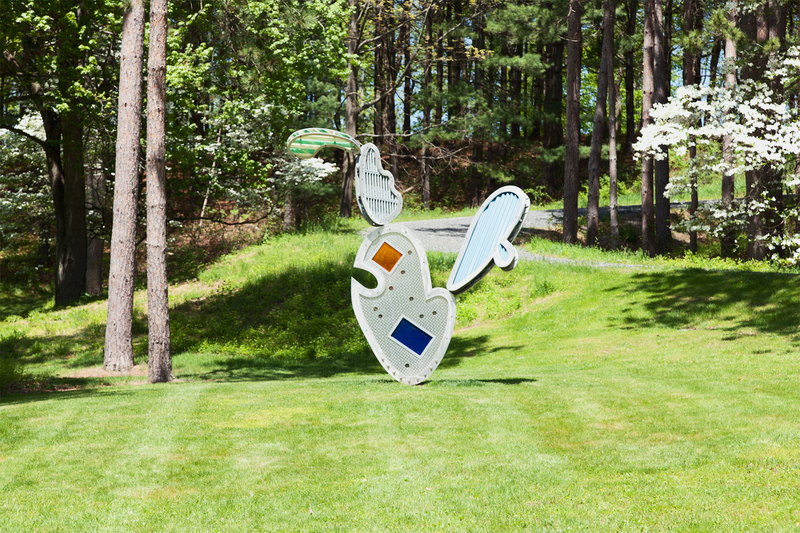 Both are on view at Storm King Art Center (1 Museum Road, New Windsor, New York).